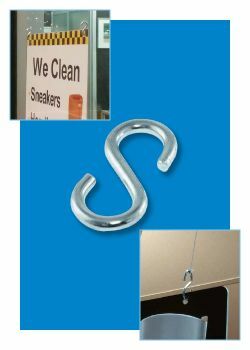 Our Metal S Hooks in this section are used in a variety of ways to attach chains and wire to finish the installation of ceiling hanging systems for retail point of purchase needs or for warehouse signage. Metal S hooks are also designed to hang from any other application such as a retail display or wall mounted adapter, clamp or hook. Their steel construction makes for a long lasting product; you have a choice on durability based on our standard or heavier duty S - Hook versions. If you are looking for a Metal S-hook for our Clip Strips, please click here for better suited options, although the SH-100 can and is used for the hanging of display strips when the size of the mounting space fits its smaller .080 diameter opening. 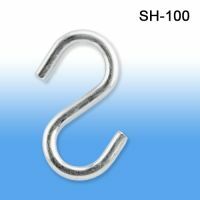 Minimum quantity for "Metal S-Hook, 1", SH-100" is 25. Minimum quantity for "Metal S-Hook, 1 5/8", SH-125" is 25.